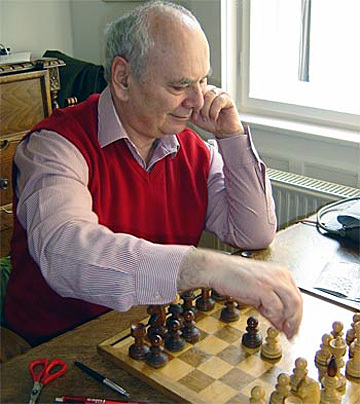 2/2/2012 – In this second part of a fascinating talk with Lajos Portisch, one of the dominating players in the sixties, seventies, and eighties, you will read about his impressions of Bobby Fischer, the study preferences of Petrosian, and his overall disdain for using chess engines. Unhappy with the focus on openings, he also proposes a greater focus on endgames. Food for thought. Albert Silver – So in the mid nineties Bobby Fischer was still in Hungary. Lajos Portisch – Yes, he stayed here for quite a long time. He very often came to visit us, my poor wife, who died ten years ago and me. She was a good cook, and when Bobby came she always served him a good dinner. Bobby ate only once a day but quite a lot. Yes, he ate a kilo of goulash. Yes. (laughs) One evening, before we ate we were analyzing a complicated line and couldn’t find the solution. We then ate and after we had done he said, “Lajos, give me five minutes to rest.” There was a sofa in the living room where he lay down, while I sat in front of a chessboard studying. After five minutes he jumped up and made a terribly strong move without hesitation. Maybe while he was resting he was still analyzing blindfold, but I don’t think so. He was just very strong, even then. That was Bobby. Did he analyze a lot with you then? Of course, I wanted to analyze with him. He was very knowledgeable. He didn’t know modern theory of course, I had to show him the modern lines, but he always immediately understood the finesses, the differences between the different lines. He said something about Botvinnik, when we analyzed Botvinnik’s games, and this is why I am not a Hungarian Botvinnik. He said, in these exact words, “Look, Botvinnik was always very precise. Even in the smallest details, he tried to play very exact.” Bobby admired him very much. That is how exact Botvinnik was. You say this as if you were different. You say you were more of a practical player. Does that mean when you did opening preparation, you looked more for decent solid positions, playable positions. No, I mean I never analyzed openings that I would not play. For example, I never analyzed the Alekhine Defense, the Philidor, or the Scandinavian. I don’t want to be bothered. I studied only what was of use to me in tournament practice. There are certain players, for example, who want to know everything. I was not that type. That is what I mean by practical. This was before the computer era. How did you prepare then? Just like now. (laughs) I used to analyze alone. In fact there is an interesting story, again concerning Bobby Fischer. We were at a chess tournament in 1970, and it was after our game, the only one I should have won. I had a forced win but squandered it and we drew. After the game we started to analyze, and Bobby asked me, “Tell me, is it true you analyze eight hours a day?” I asked him, “Why do you ask? People say that you also analyze eight hours a day.” “Yes”, he said. “But people think I’m crazy.” (laughs). Ok, of course sometimes I was able to analyze eight hours in a day, but not everyday of course. This is perhaps the only valid comparison with Botvinnik as he also worked hard. How did you store all your information? I was told that you had a card filing system with photocopied or even hand-written games. Your famous “kartotek”. Yes, I had my own notes. Now it is easier because I have a printer so I can easily print games, but everything was hand-written at that time. Have you modernized your system? Have you considered putting all this information into a computer? (laughs) Well, I have had to accept this modern life. For example, I am speaking with you now over this Skype thing. But it’s a wonderful thing. I mean consider, there was a time even just twenty years ago where to be able to speak to you like this would have required an international phone call which would be of an extremely high cost. Yes, it would have cost us a fortune, and now of course, everything is free. But yes, the Internet is useful. You can get the games immediately from Wijk aan Zee for example. At that time, we had to wait a month for them to arrive by mail. Still, due to this information it is no surprise that young players can reach their peak quicker than players of that time. Botvinnik used to say that the peak for a chess player was at 35-40 years old. And now Anand and Gelfand are both forty, but behind them are a lot of young players. The number one now is that Carlsen, and he is only twenty years old. Many young players are developing very quickly. What do you think of the current tournament schedules? The playing schedules have been changed quite a lot. This time control of forty moves in two hours followed by a half an hour for the rest of the game spoils the entire endgame phase. I’m afraid the gentleman of FIDE are simply not chess players and do not understand the spirit of the game. They are just officials and I rather doubt there is a strong player in the lot that establishes the rules. The rules should be changed as the endgame is completely spoiled. Of course with computers today, adjournments are no longer possible, but a solution should be found. I have studied chess history, and in the early 20th century and even later, the first time control was after thirty moves, not forty. Why not shorten the time of the first time control to one hour for thirty moves? Everyone knows the openings extremely well nowadays, with the internet, ChessBase, New in Chess and so on. That way there would be more time for the ending. Certainly what is going on now is no good. So you would prefer less time for the opening and more time for the rest of the game. Exactly. Actually, I must tell you I enjoyed the Dutch system very much, and it was why I was so successful in Holland. They scheduled all their games at one o’clock. Do you know why? Holland used to be a very traditional country, and six o’clock was dinner time with the family. So we played five hours, then at six o’clock we stopped for two hours to have dinner, and then we resumed play. If you had an adjourned game you would analyze while you were eating. I liked this system very much. You only ate twice a day, breakfast and dinner, and while we played we got some snacks and so on. What were the playing conditions like then? In the beginning they were very poor. We were lodged with families for example, and there were only one or two hotels in Bewerwijk. Also the food was very poor. I even had to protest more than once. They were surprised that someone from behind the iron curtain would complain as I demanded more meat. I would sit at dinner and see potato, potato, so much potatoes and no meat? Later this improved after the venue was moved to Wijk aan Zee where they had a good hotel, the Hoge Duin. Now they are probably very good. What kind of physical preparation did you do on a regular basis? I was a better swimmer than tennis player. In tennis I talked all the time and my partners got upset. I was a good swimmer, and every other day would swim for an hour at the best swimming pool in Budapest, where they reserved a lane for me. Now I sing more, and even in singing physical preparation is very important. You need to be tough, concentrated, and fit. Just like chess, you cannot sing if you are not fit. Do you engage in a great deal of music? Last year I had many recitals because it was a Liszt year, and I sang many of his Lieder. My favorites are the German Lieder, from Beethoven to Strauss. I know many and sing them often. I would like to thank you for taking the time for this interview, and I hope we can do it again.